Every year, my family attend a special Christmas service held in a small village Church. During the service, carols (Christmas songs and religious hymns) are sung and stories about the birth of Lord Jesus Christ told. The Church had been beautifully decorated, as always, with candles,holly, ivy and a huge Christmas tree stood next to the altar. During the service, between the carol singing, the rector (priest) took some time to tell us about the poinsettia plant and it’s significance at Christmas. This plant with it’s striking red leaves is always sold in supermarkets and florists during Christmas, featured in Christmas cards and decorations; and I’ve never known why. I just assumed it was because their amazing red colour was so, well, Christmasy. Just before I left India, I was surprised to see poinsettia for sale in a garden shop! They are everywhere! The legend of a small girl called Maria has been told in Mexico since the 16th century. Maria was too poor to give a gift to the Church to celebrate the birth of Jesus Christ, this distressed her so much she wept for days. A beautiful angel wearing golden robes came down from heaven to comfort the weeping child,’The most precious gift you can give is your love”. Maria smiled through her tears and lovingly gathered the small weeds around her, she tied them together as neatly as she could and ran to the Church. The child placed the weeds on the altar and squeezed her eyes tightly together in prayer, when she opened them, to her amazement she saw her weeds had spouted crimson leaves in the shape of the star of Bethlehem. The star of Bethlehem is the Christmas star, the star which appeared when Jesus Christ was born. A gift given with love is the most beautiful of all. P.S. I just had to share the photo I took two years ago at the same service, I think this photo is particularly beautiful because the sun hadn’t set, so you can see the beautiful stained glass window next to the Christmas tree! Beautiful story isn’t it!! I have a new affection for them now! It’s a blessing to remember these stories. It is also time to review all the things that make our shared time on this Earth more memorable and warm. Glad to have discovered your blog. Merry Christmas! I never heard this story before. 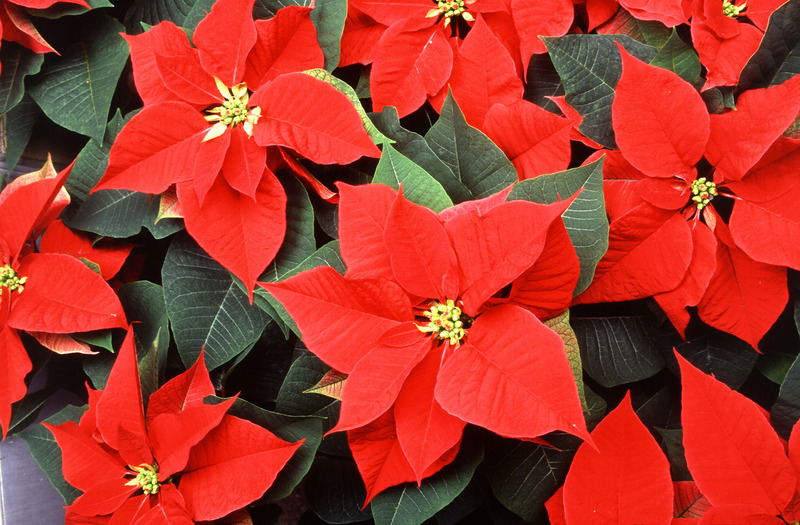 But in French Poinsettias are called “Etoiles de Noel” which means Christmas stars in English. Merry Christmas to you, Lauren. Loved the Silent Night carol. Reminded me of my school days(I was in a convent school where we would sing carols). Loved your story about the poinsettias. Aww so glad :D! It’s a beautiful carol! Very happy to see you writing again…merry Christmos. Thank you so much, Shailesh! I hope you are well! Happy New Year! Merry Xmas to you and your family. I am glad that you are having a cheerful time there. Thank you so much, Anshuman! It’s the very first time that I am hearing about the poinsettia.. Very interesting legend. I learned something new today! That stained glass window is indeed spectacular!